Cosmos e Vida: Here are the real photos. Bhima's son Gadotkach like skeleton found - Real or Not? Recent exploration activity 1n the northern region of India uncovered a skeletal remains of a human of phenomenal size. This region of the indian desert is called the Empty Quarter. See the photo and note the size of the two men standing in the picture in comparison to the size of the skeleton!! A very small article on this was published in Times Of India- Mumbai edition on 22-Apr-2004. The discovey was made by National Geographic Team (India Division) the support from the indian Army since the area comes under the jurisdiction of the Army. The exploration team also found tablets vdth inscriptions that stated that our Gods of Indian mythologicalyore, Brahma", had created people of phenomenal size the like of which He has not created since. They were very tall, big, and very powedul, such that they could put their arms around a tree trunk and uproot it. They were created to bring order among us since we were always fighting with each other. One of he sons of Bhima of the Pandava brothers is also thought of to have been carrying these genes. Later these people, who were given all the power turned against all our Gods and transgressed beyond all boundaries set. As a result they were destroyed by God Shiva. 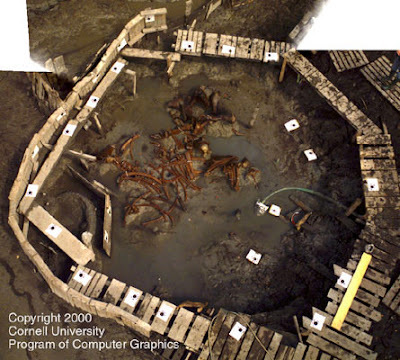 On September 16, 2000, Steve Westin of our staff was a guest at the site outside Hyde Park, New York, where the Paleontological Research Institution and the Cornell Department of Geological Sciences are excavating the skeleton of a mastodon. The image first surfaced in October 2002 as an entry in a Photoshop contest run by Worth1000.com. It was created by altering an actual photo of a Cornell University excavation of a mastodon skeleton. ere are the real photos.